The virus came swiftly. Young, Old, it didn't matter. Once infected you were dead. When a Virus of catastrophic proportions sweeps the country by storm the only thing Eva can do is watch and wait and hope. That is until the announcement that a National Raffle will be held. Fifty thousand lucky souls will be given a chance to wait out the virus in specially built Pods. Those chosen will live in them for a year in hopes that the virus dies out. Out of 313 million Americans Eva is spared. She is chosen, she is safe, least that is what she thought. While those in the pods wait below ground, above ground the virus has other plans. They thought the virus would die, they were wrong. I knew PODs would be special when barely 10 pages in I was left near tears. 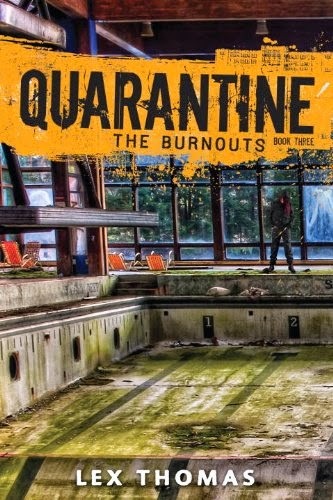 Eva the main character is kept shielded as much as possible from the horrors of the world outside by her parents but reality has a way of kicking down the door making its presence known. I loved reading Eva's conflicted feelings knowing she'd be spared while trying to come to terms with the fact her parents would not. It has to be awful knowing that in just two weeks time you might never see your friends, family or neighbors ever again. Needless to say by the time Eva leaves to join the other survivors I was an emotional wreck. The story really picks up once Eva is introduced to her Pod mates. I thought the story might suffer having the characters stuck in a room for a good chunk of the book but this surprisingly didn't happen. I loved the dialogue and seeing the survivors day to day lives and relationships unfold. My favorite character next to Eva was George. He just seemed so sweet and I liked how protective he was of everyone especially Tiffany. My least favorite was Josh but that's OK he was written that way to begin with. I was glad when he exited the story, for now at least. Now while I really liked PODS I do believe the story fell apart a bit in the middle. The day to day life in the pods was interesting but just a bit repetitive. The middle could of been condensed a bit and I would of been fine with that. I also felt the story could have had a bit more information regarding the survivors in other pods. It's mentioned they have an Inter Pod network and we do see the character Katie talking to someone on her laptop but overall it was actually utilized very little. Another small issue I had with the story takes place once the survivors emerge from the pods. It felt way to convenient that they were separated into small groups thus creating a reason why Eva would inevitably leave the safety of her compound. Speaking of Eva's departure, can I just say that I understand Eva and David lust after each other but lets be real here they were thrust into a situation where he was practically the only choice for a relationship. Eva's "love" was more dependency than anything else. Their relationship reminded me of Katniss and Peeta from The Hunger Games. It was a relationship of convenience nothing more, nothing less. Personally, I wasn't feeling it. Overall, PODs is an incredibly well written story above love and survival in the face of adversity. While the back story and world building is lacking some the character development was great and by the end I was certainly left wanting more. I guess this begs the question,Would I recommend PODs? A resounding YES! I loved Eva she was a great character and after that ending I need to know what happens next. 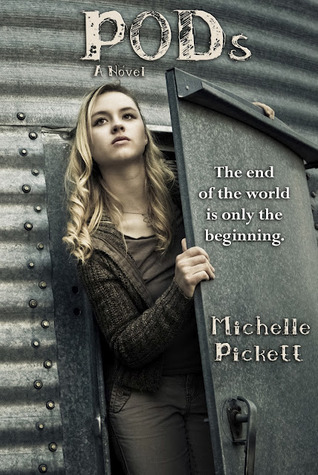 With that being said, I will be rating PODS by Michelle K. Picket ★★★★. Win a PODs Prize Package!